"Mr. and Mrs. Watson have a pig named Mercy." That's a fact, but Mr. and Mrs. Watson treat Mercy like their own child. There's the bed, the goodnight song, the climbing in between them to sleep in the night, and the hot toast with a great deal of butter on it. Mercy likes hot toast with a great deal of butter on it. One morning the family, Mr. and Mrs. Watson and Mercy between them, awakes to the sound of the floor beneath them cracking. Seems adding Mercy to the bed was too much for the floor to handle, and they have begun to fall through. As the floor BOOMs and CRACKs, Mercy escapes to solve the biggest problem she's faced in some time. Maybe there's hot toast with a great deal of butter on it in the kitchen. Nope. Aha! Her neighbor, Baby Lincoln, often has sugar cookies! So Mercy gallops off to find some cookies, and we meet Baby and her sister Eugenia. Unfortunately, Eugenia is not nearly as sweet at Baby (or the sugar cookies) and believes pigs should not be neighbors. Pigs should live on farms. Phone calls are made, emergencies are declared, a chase occurs, rescues are made, and everyone (well, almost everybody) lives happily ever after celebrating their little "porcine wonder." And of course there's hot toast with a great deal of butter on it. Mercy Watson to the Rescue has pictures on nearly every page that add perfectly to the silliness of the story. New readers will easily be hooked on this early chapter book series. 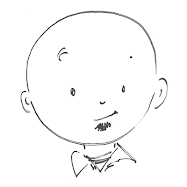 Experienced readers will enjoy it too, not because of the success they feel from reading their first chapter book, but because it's fun. I think that's the best way to describe it. Fun! 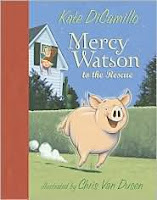 Other Mercy Watson books: Mercy Watson Goes for a Ride, Mercy Watson Fights Crime, Mercy Watson: Princess in Disguise, and Mercy Watson Thinks Like a Pig (July 2008).